Almost any plant material that grows anywhere in the world can be trained as bonsai. Practically speaking, however, some varieties work a lot better than others. 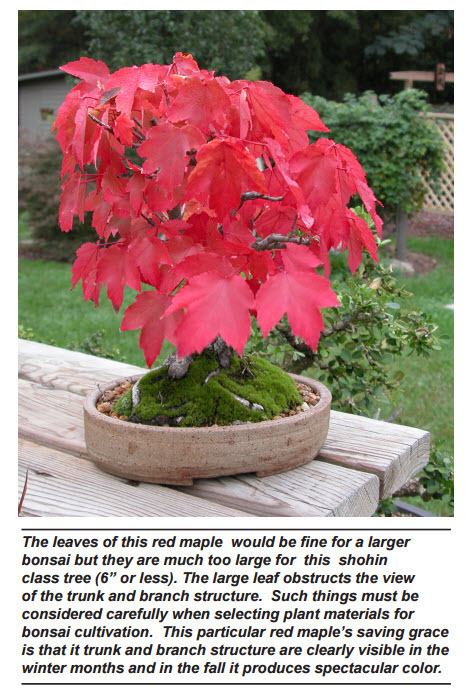 You will find a partial listing of plant materials suitable for bonsai elsewhere in this publication. Don’t let the list stop you. You should attempt to inflict your artistic ideals on any horticultural specimen that strikes your fancy. Who knows. You may be the first to break new ground in the bonsai world. We can tell you, however, that if you are determined to turn your zucchini or your marigolds into bonsai… you have a hard road ahead of you. 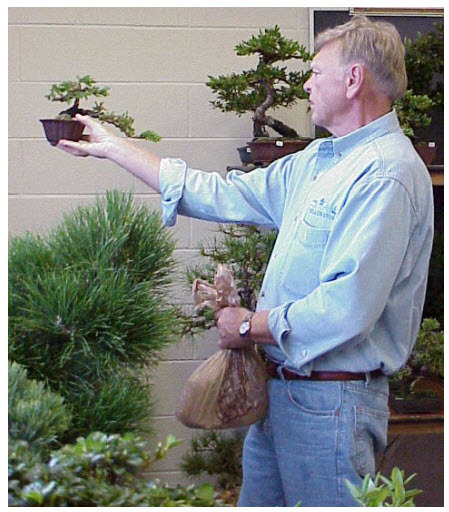 When searching for suitable plant materials to train as bonsai, artists generally use two basic criteria. First of all, they search for plant materials which have a small or genetically dwarf growing habit to start with. There is nothing which is done in the bonsai process which causes the plant to stop growing. Likewise, apart from a few minor bonsai “tricks,” there is nothing we do make the leaves or needles become smaller. While it is true that removing a plant from the soil and placing it in a container will cause its growth to slow and its foliage to reduce in size by about 25 percent, it has nothing to do with bonsai horticulture. It will happen to any plant placed in a container. Plant which have naturally small needles and leaves help the bonsai artist to maintain scale in his creation and to convey the impression to the viewer that they are seeing a miniature of nature. Instead of selecting a pitch pine which has 6 inch long needles we work with Scots pines or mugo pines which have a natural needles length of one inch or less. Rather than selecting an American Elm which produces leaves the size of a human hand, bonsaists opt to work with Chinese elms which produce leaves the size of a fingernail. If the tree is to be styled as a shohin class plant (6 inches tall or less) then the selection of overall foliage size becomes critical. If the bonsai is to be cut as an imperial class tree (3 feet or less) the artist might wish to select material with a slightly larger leaf. The concept is pretty simple. A six inch high tree with 4 inch long leaves will look silly. The same 4 inch long leaves might look fine on a large bonsai. 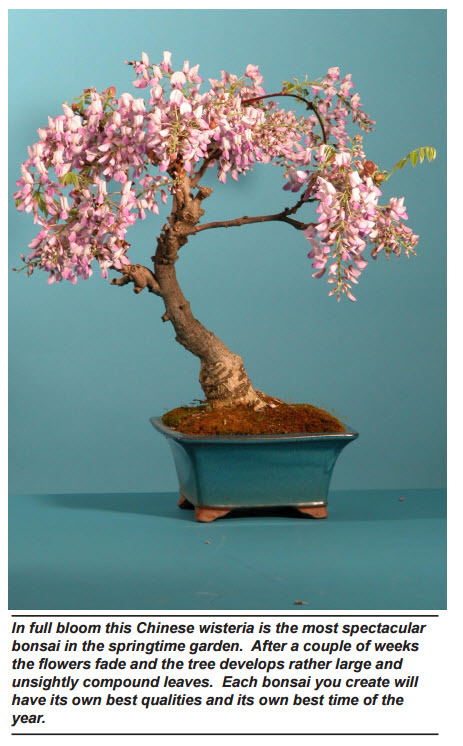 The right plant material is largely dependent on the artists artistic vision..
Secondly, bonsai artists look for plant material which will readily produce buds on old wood. Very few bonsai are created from seed. When material is select for training as bonsai it has usually already been growing somewhere else for a number of years. That somewhere might include in a field, in a cow pasture, on the side of a mountain, as a foundation planting in someone’s yard or on a local nurseryman’s growing lot. We will discuss why such material is more suitable for bonsai in the next chapter. For now, know that usually raw stock selected for training as bonsai is usually obtained from larger plant material and cut back to force new green growth closer into the plants trunk. In order for this to happen efficiently, the material selected needs to be willing to produce green foliage on the older inner wood of the plant… i.e. – to “bud back”. The tendency of all plants to produce new green growth on the tips of the plant. Remember what we said before. The plant doesn’t know its supposed to be a 10 inch high bonsai. It thinks it is supposed to be a big tree. The bonsai artist tricks the tree into producing foliage in an area which fits into the artist design. This will only work if the plant material in question is willing to cooperate. Plants that do not bud back well can be used as bonsai, but the techniques used in obtaining the desired results are more difficult. Using the two criterion outlined above narrows the available list of plants suitable for bonsai training down to several thousand. If you were like we were in the beginning, you will be determined to have a crack at most of them. After a while, you will learn to work with trees that want to work with you. In the end, the selection of materials you use for bonsai will largely be determined upon personal preference learned through trial and error. As you work with the trees you will learn each ones idiosyncrasies. Some trees adapt to the wiring and shaping process readily. Other crack branches at the slightest pressure. Some tree actually seem to enjoy growing in a bonsai pot while other refuse to put up with it. Some trees die at the slightest cold. Others endure winter’s extremes without a complaint. Some trees seem prone to disease and infection while others never get so much as a sniffle. Bonsai are very much like people in this respect. They all come with the same basic equipment and parts, but they are all individuals. It will be up to you to get to know the likes and dislikes of each of your new bonsai friends. It is assumed that someone new to the art will be prone to making a few mistakes. For that reason, it is advisable for beginners to work with some of the less fussy plant varieties while learning to master the fundamentals of the art. As their technique grows, so can their exposure to many delightful variety of plant materials suitable for bonsai.